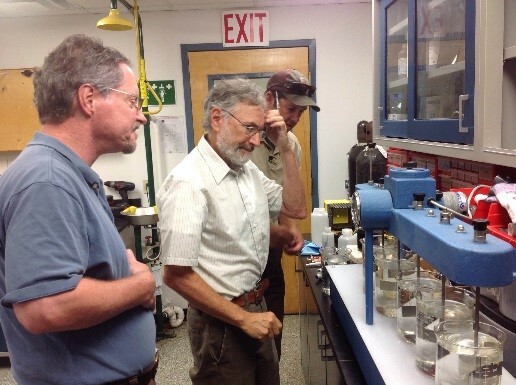 Champlain Water District (CWD) draws water from the Shelburne Bay in Lake Champlain. The LaPlatte River flows into the south portion of Shelburne Bay, within CWD's watershed. As part of a continuation of a Lamprey control project, the US Fish & Wildlife Service developed a program to apply 3-trifluoromethyl-4-nitrophenol (TFM) into the lower portion of the LaPlatte River to control Lamprey populations in the river. Although a maximum contaminate level (MCL) has not been developed by EPA, the State of Vermont Department of Health had a health advisory limit of 35 parts per billion (ppb). The results of lake modeling software indicated that TFM concentrations at the intake would be as high as1-2 ppb. However, prior to the application the DOH dropped their health advisory limit to 3 ppb. In addition, DOH officials indicated that if the concentration in the finished water was above the 3 ppb, water systems would be required to issue a "Do not Drink" order. This risk was not acceptable to CWD and a treatment approach was developed to insure the water reaching customers did not exceed the new health advisory limit. CWD contacted Dufresne Group to assist in developing a treatment approach for use during the lampricide addition. DG had previously assisted the City of Burlington implement a powdered activated carbon (PAC) feed system during the Winooski River lampricide addition. Various PAC treatment alternatives were considered using both economic and nonmonetary considerations. CWD staff including Jim Fay, General Manager, Joe Duncan, Chief Engineer, and Mike Barsotti, Director of Water Quality and Production, assisted in the evaluation and rental of a "super-sack" system which was selected for use during the temporary lampricide addition. As part of the investigations, Ray Solomon, DEC Chemist, was brought in to pilot the PAC removal process with assistance from Mike Barsotti and laboratory staff from the US Fish and Wildlife Service. This team approach fast-tracked the evaluation period and the results demonstrated effective removal using PAC. The PAC was placed online prior to the lampricide addition and remained on-line past the time the lampricide passed through the bay to insure TFM levels were below laboratory detection limits. The PAC adsorbs material and is then removed as part of the treatment process. CWD officials monitored the PAC removal results for both TFM and for possible future removal of currently unregulated contaminants. Fortunately, TFM was not detected in either the raw water from the lake or in the finished water during the USFWS application. CWD was the first water system in the United Sates to receive the Partnership for Safe Water Programs Excellence in Water Treatment Award, and continues its role as a national leader in providing safe water to its customers. DG is proud to assist CWD in maintaining their reputation as a national leader in the water works field.